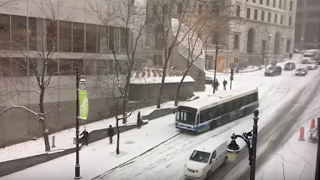 A slippery road covered in ice and snow on a steep street in downtown Montreal has caused a slow-motion pile-up of cars, buses and trucks. The drama took place at a busy intersection on Côte du Beaver Hall. 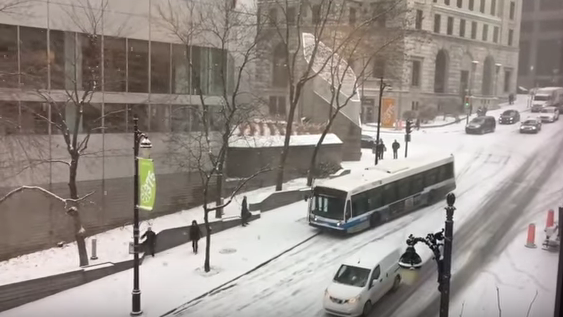 Footage shows a bus sliding out of control and hitting a group of vehicles. Some minutes later, as the light flurries of snow continue to fall, a pickup truck hits the back of the bus. Then another bus, also out of control as it comes down the hill, bumps into the back of the mini pickup truck. When everybody thought it was over, A police car came sliding backwards down the hill, lights blazing, hits the bus. Finally a snow plough, probably sent to clear the snow, came down the hill, hitting the police car pretty hard. The good thing is no one was injured in the pile up, which involved at least 10 vehicles. ONe of the witnesses Colin Creado who saw the crashes on his way to work said the officers had managed to get out of the police car before the salt truck crushed on it. “I could see the cop car literally jump in the air. It was pretty powerful,” he told CBC. He said that he was surprised city authorities had not gritted the street before the snowy weather hit during the night. The Video of the chaos posted by CBC on Twitter has been shared more than 9,000 times. The absurdity of the situation was not lost on social media users.